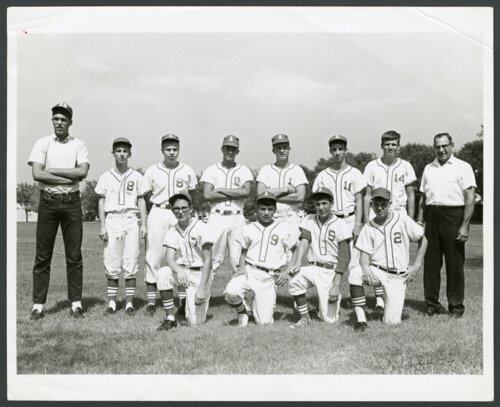 This photograph from the early 1960s shows the Western Auto Aces, a youth baseball team in Wichita sponsored by the Western Auto Supply Company. Standing in the back row are (l to r): Russ Anderson (coach); Sheamus Litchlighter; Ken Nelson; Bill Caperton; Larry McDowell; Bruce Anderson; Kenneth Knox; Martin Berndsen (manager). Kneeling in the front row are (l to r): Mark Berndsen; unknown; Larry Rate; Bernie Linnebur.